Body awareness is the ability to understand where our bodies are in space and how our bodies move. Body awareness helps us to understand how to relate to objects and people at home, at school and outdoors. For example, proper body awareness tells us how far to reach for objects or how close to stand next to a person. Sometimes, if people have difficulties with body awareness they may appear clumsy, uncoordinated or have delays in motor skill development. Proprioceptive input (heavy work activities): This type of input gives our muscles and joints information about how our arms, legs, head and trunk move. Any weight bearing activities are technically proprioceptive input. Here are some examples: wheelbarrow walking, jumping, stomping the feet, push ups, pushing/pulling, carrying heavy objects, etc. Play games that involve identifying body parts. Simon Says is a wonderful game to encourage body awareness and self regulation. Call out more than once activity to increase the challenge such as “Simon Says touch your right hand to your left knee”. Check out these free Simon Says cards. Mirror Games: Give each child a partner. When one person moves the other person has to copy their movements exactly. Have children try to mimic poses of different movements with these body position cards. Try copying the exact actions of the children pictured in the Move Like Me cards. Practice spatial awareness. Set up obstacles courses for children to go under, over, through and around objects. Here are more ideas for spatial awareness. 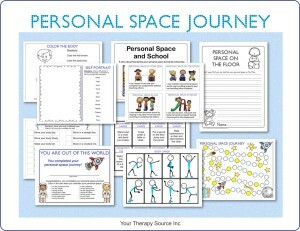 Summary: Collection of activities to teach children about personal space including many body awareness exercises and a social story on personal space. FIND OUT MORE.